Hey everybody, it's Truffles! 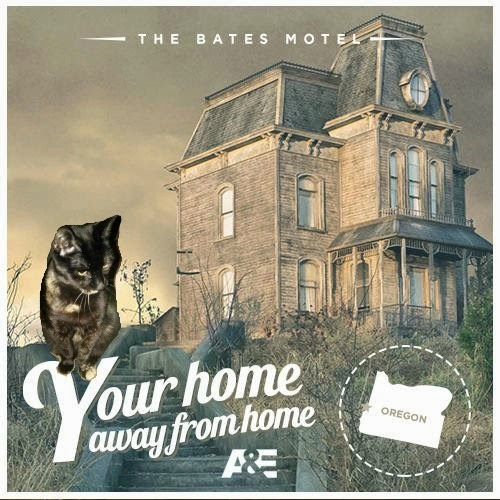 Mommy was pretty excited this week when she found a website where you can create customized Bates Motel postcards. It's her favorite show and the original Psycho is one of her all-time favorite movies. Mommy, I'm scared. We don't really have to stay here, do we? You do realize that Norman Bates practices taxidermy in the basement, right? Check out more artsy felines here. Love it and thanks, I just entered the contest. I think we need to start having themes weekly. Thoughts? We love Bates Motel too! Love the postcard! Oooo, scary. Good one. That was a great movie. Thank you for stopping by today and for your kind words. It is bittersweet to know we share the same journey. Your Caturday Art is fantastic! I have begun contributing but today marked Abby's loss. Thank you again for coming by and please come back. Whoa! How cool is this! Stay out of the shower. Bwaaa-ha-ha! Purrfect for your blog's book genre!